Brandt Peters, Kathie Olivas, Chris Ryniak and Travis Louie take over the booth for multiple Circus Posterus limited edition releases available only at this signing. 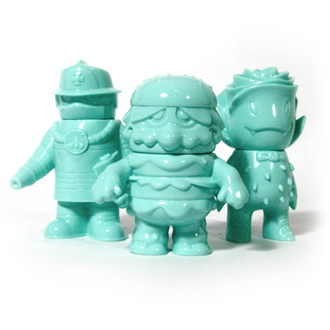 Featuring David Horvath, Le Merde and Paul Kaiju, this three pack features one blank Monster Family figure from each artist perfect for signatures or customization (only available at this signing). Featuring Josh Herbolsheimer, Arbito and Jeremy Whiteaker, this three pack features one blank Monster Family figure from each artist perfect for signatures or customization (only available at this signing). Featuring Brandt Peters & Kathie Olivas, Itokin Park, and Bwana Spoons, this three pack features one blank Monster Family figure from each artist perfect for signatures or customization (only available at this signing). Our last SDCC signing, Super7 founder Brian Flynn, Tokyo Japan's KaToPe, and Brooklyn favorite Lamour Supreme will have customs, resin figures and a blank Drunk Seijin exclusively for this signing.